When factoring in the highest quality gaming graphics there is more to the situation than simply throwing hundreds or even thousands of dollars into a High end gaming parts. Throughout this article I will try to highlight the major factors required in obtaining the best graphics that you can muster up. Hopefully you will find some things that you never thought of, and if you have then props to you, you have a good grip on gaming graphics. Throughout you will find both synthetic and real world benchmarks to prove the points I will make. While real world benchmarks are the holy grail of any benchmarking scheme, synthetic ones provide a standard test that provide a more general overview of the situation and often synthetic benchmarks provide a score which gives you a good basis to see how much you have improved your situation. All tests are done on my dual loop water cooled computer, the stats can be seen by going to the computer section of the menu and then clicking IV Inferno. As always if you know something that I haven't shared here. Let me know and I will tweak the article. First and foremost, graphics quality comes down to horsepower – no surprise there! The amount money you are willing to shell out will be the single largest determining factor here. I will deal with ATI/AMD cards in my tests and this is what I use on a day to day basis. The currently the highest performing, fully developed card line that come from AMD is the 6900 series. While yes there are 7900 series cards, this line still has yet to receive the dual GPU flagship card (7990 - ??). So lets tackle this with the 6900 series cards. There are a few things that you need to know about the AMD 6970 and AMD cards in general. AMD currently holds the performance crown when comparing AMD to Nvidia Cards. I won't get into benchmark comparisons between AMD and Nvidia or even in the different cards themselves. I don't have the resources to provide such a comparison, and there are plenty of other articles around that have already tackled this topic. - Drivers are known to be of poor quality compared to its competitive counterpart. 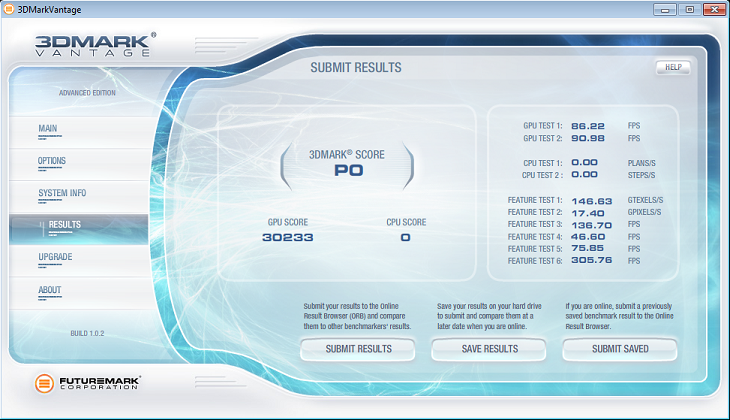 In the above scores of 3DMark 11, you can see the result of a single AMD 6970 which got a score of P5537. The second image shows P8881. Upon doing the math of the results this showed a 62% increase in performance. The results of the graphics test's frames per second shows over a 100% performance increase in most tests. While this does not make a lot of sense as you can only add 1 graphics card in this situation which theoretically can only show a maximum of 100% performance increase over a single card configuration. Usually frame rate performance increases of this nature are because of optimized drivers. CPU performance in gaming graphics is secondary to the graphics cards when trying to obtain high frame rates in your games. However even though it is less important, a CPU bottleneck can negate any performance gains by your GPU, so yes CPU power is important. When selecting a CPU for the computer there are a few important things to note. First buying a six core CPU will not net you increased frame rate over a four core CPU. This is largely due to the fact that most if not all games are not configured to use more then one core. You are likely to get more mileage out of your CPU by buying a faster CPU rather then a CPU with more cores. 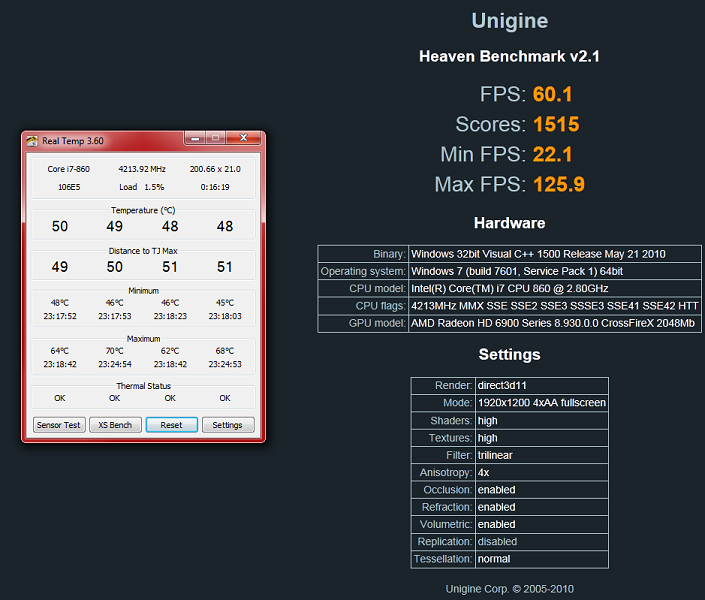 To illustrate these statements I have overclocked my CPU and then run some benchmarks. 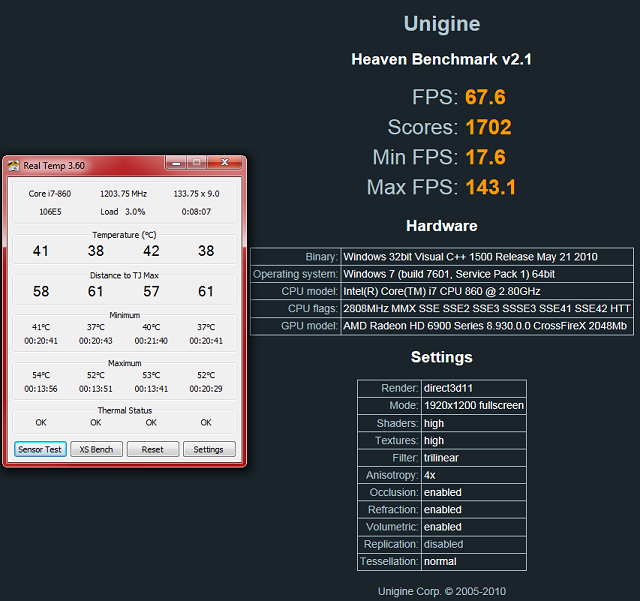 From the benchmarks shown you can see that there is an improvement in the frame rates and the overall score. For Haven you can clearly see that when the CPU was overclocked to 4.2 GHz that the min frame rate went up while the maximum frame rate went down. This is likely do to a bottleneck in the scene when the lower frame rate was generated, most likely when CPU was called upon for processing such as a scene with a large amount of physics involved. I have noticed this trend in more then one benchmark in the past. As for the 3DMark Vantage score you can see the increase clearly. The average frame rate of the scene went up by about 20 FPS in one test and 10 FPS in another test. Again this is likely due to the fact that the lower frame rate increased. The 3DMark 11 benchmarks show less of an improvement the overall score is higher with slight frame rate improvements over the stock clock speed of 2.8GHz. Now that you have a basic understanding of how the hardware in your system contributes to graphics performance, we now need to touch on the product of all this horsepower: The graphics themselves and more specifically the screen you are using. First off, screen size dictates your total viewing area. Screens are measured in the diagonal of the screen, not from side to side. So basically the horizontal distance is lower then the side to side distance. The next factor to consider is the maximum resolution of the screen, most screens you will find are 1920 x 1080 (1080p) or 1920 x 1200 (1200p). There are screens that have a resolution of 2560 x 1600 (1600p) which are obviously the top end screens. Also note that some television screens have a resolution of 1080i. This is known as interlacing, where as the p stands for progressive scan. Wikipedia has an article on what this means, which is available here. Now that we have this out of the way this brings me to my most important point about the quality of the graphics on your screen: PPI or Pixels per Inch. The more pixels per inch the more detailed the image is on the screen, the crisper the image will appear and the better your games will look. Think of it like this a 50 inch screen at a resolution of 1200p will not look as good as a 27 inch screen at 1200p or even a 24 inch screen for that matter. Again wikipedia also has a good article on finding the pixels per inch of a screen. For example a 30 inch screen with a resolution of 2560 x 1600 has a PPI of 100, where as a screen of 27 inches with 2560 x 1440 has a PPI of 108. So this shows that the screen with the lower resolution will actually look better then the screen with the higher resolution. Resolution isn't everything you know! Select a screen with the highest PPI and you will be selecting a screen that looks the best. The last topics I want to touch on when trying to obtain the best graphics possible is refresh rate, colour gamut and response time. When you pay for the hardware to obtain 80 frames per second in your favorite game are you really seeing your 80 frames per second or is there a bottleneck in your way? If you didn't consider your refresh rate (measured in Hz) then you may only be getting 60 frames per second. Most monitors only have a refresh rate of 60Hz which means the monitor will display a maximum of 60 frames per second robbing you of your 20 FPS that your hardware is generating. Getting a monitor of 120 Hz is a good bet to make sure your getting all the FPS that your computer is putting out. Colour gamut is simply the number of colours that a monitor can display. The higher your colour gamut the better the screen will be able to represent what the graphics artist of the game was intending you to see. Most entry and mid level monitors come with a colour gamut that will accurately display 16.7 Million different colours or a 96% colour gamut, where as a high end monitor with a colour gamut of 110% will show 1.07 billion colours accurately. That said, it is important to note that most people will not notice much of a difference between 16.7 million colours and 1.07 billion. High colour gamut is a luxury and is not required by any means. The last thing you should consider is the response time of the monitor. The response time of a monitor determines how quickly the pixels can change colour on the screen. This is measured in milliseconds and is usually the time from changing black to white. However be careful of gray to gray response times as these are different then measuring the response time of black to white. Monitors with low response times (think more then 8 milliseconds) will show ghosting when the image on the screen is moving. This is due to the fact that the monitor is trying to catch up to the changes in colour. Monitors with great response times typically clock in around 2 and 3 milliseconds. The difference in ghosting is noticeably different between a high end monitor and the low end. Hopefully you found this information useful to you when selecting parts for a custom gaming rig. In future articles I hope to explain the points on customizing your graphics from the game itself (think anti aliasing) and again how to obtain the best graphics from your game.